Located in West Augusta, Virginia. 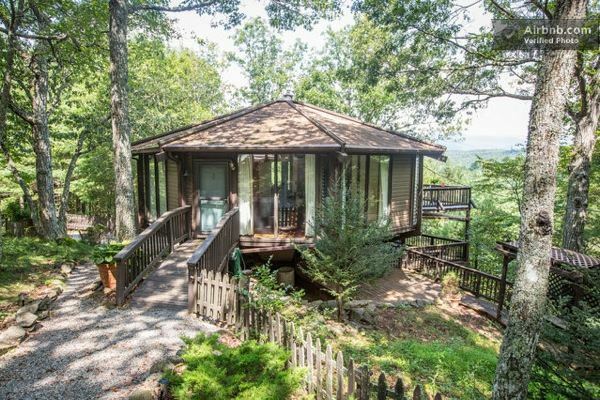 View more photos, learn more and book this octagon cabin here. If you enjoyed this small wooden yurt / octagon cabin you’ll love our free daily tiny house newsletter with more! Beautiful! That’s been my “ideal house” for about five years, though I’d have a bit less glass in the bedroom. Big windows conduct a lot of cold. There is a company out there that does kits of small wooden yurts that look really nice, but I don’t think this is one of theirs. Gotta love the Swingin’ Sixties bachelor decor!!!!! Esp the round–um—couch! Love the house tho and altho I am not usually a fan of black for kitchens this one is perhaps the one that could change my mind on that! I would add castors to the island tho—–and hide the TV cords and maybe upgrade the furniture—the pressed board “book case” just stands out as a cheap fill in for a real piece of furniture. Where are the plans and estimated costs for this home? I love it!!! The yurt is my all-time favorite design and I really love this one. Wish they would have included a diagram so I could visualize it in totality. I’d also be interested to know the cost of building this house. I love tiny houses, but now sorta switching to yurts. I can’t visualize this one either, Gypsy, but doggone, its gorgeous! And I fear not in this Penny-pinching budget! Would love to see the images, but can’t get them to load. I get black blocks with the little square inside every time. I think that I could stand a few months being ‘stuck’ here.